A Picture Guide to Learn about Low Carb and Ketogenic Foods. Preparing and Cooking Low Carb and Keto Meals: The Quick, Easy and Enjoyable Way! THE EASY WAY TO KICK START A LOW CARB OR KETOGENIC DIET. THIS PICTURE GUIDE WILL TEACH YOU ABOUT WHOLE FOODS TO MAKE A LOW CARB OR KETO LIFESTYLE HEALTHY, REALISTIC AND ENJOYABLE. An increasing amount of research into the low carb and Ketogenic approach to eating is published. As the evidence of benefits grows, more people find out that this is the lifestyle that could help them regain or optimize their health. What does this mean for most of them? A complete overhaul of their diet! This can be daunting and overwhelming at the beginning. Some people aren’t used to eating whole foods (like fresh vegetables, unprocessed meat, nuts or seeds) and don’t even know what they look like, let alone what to do with them. And there are those macronutrients (fat, protein and carbohydrates) that are clearly important to keep an eye on, especially on a low carb or Ketogenic diet. Some patients with a chronic illness, for instance, get a meal plan from a nutrition professional that tells them to eat a certain amount of fat, protein and carbohydrate with each meal. Without going into much detail what this actually means. But most of us have no clue how much chicken, for instance, we can eat to consume 20g of protein (no, it’s not 20g!). Or whether butternut squash or pumpkin is lower in carbohydrates. Or how many tablespoons of olive oil have to be added to a salad dressing to include those 30g of fat. And this is where this picture guide comes in – regardless of what stage of a low carb or ketogenic diet you are! Are a total novice: You have no idea when somebody talks or writes about certain foods. You only have very basic cooking skills and you have trouble following complicated recipe instructions or meal plans. In short- you like to keep things simple! The pictures will show you exactly what foods to focus on, what they look like and how much you ideally include in your meals. Have started making changes but you are overwhelmed: you might have started to weigh every single food you eat but find this too hard to do in the longer term. You are keen to take this work but you lack the necessary knowledge in food. And you have no intention to take your weighing scales to a restaurant or party! Have been following a low carb or keto lifestyle for a while and it really suits you. Maybe you’re even successfully managing an illness with this approach and you’re keen to keep going. But you need more food inspiration, variety and fine tuning of your protocols. Maybe you’ve also been weighing your food so far but you want to have the confidence to move on, relax a bit, and make it easier without “falling off the wagon”. You like the idea of using pictures to work out your macronutrients (i.e. how much protein, fat and carbohydrate you eat with each meal). Are a supporter or carer of somebody following a low carb or ketogenic lifestyle and want to know how you can prepare simple meals that don’t take much time and effort. The pictures can also be a great help for a shopping trip and give you a rough idea of quantities needed. Are a medical professional who likes talk about food with your patients and how it can benefit their health. It’s a great way to kick start food knowledge, encourage patients to increase their vegetable intake and focus more on whole foods rather than packaged products. 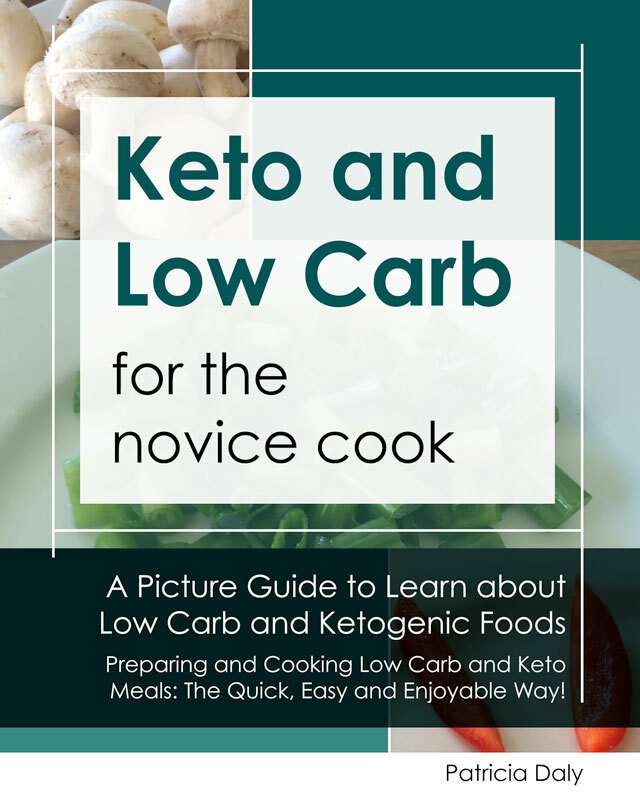 "Keto and Low Carb for the Novice Cook" will be an invaluable guide to making the low carb and keto lifestyle easier and sustainable. And this while optimizing your micronutrient intake (vitamins, minerals and other important nutrients) by using whole, unprocessed foods! How much of a particular vegetable or fruit you prepare to make sure you eat 1g of net carbohydrates. How many nuts or seeds you can eat to stay at 1g of net carbs. And with how much fat and protein this portion comes with. Protein Choices show you at a glance how much protein (split into 10g or 20g portions) a particular food (e.g. white fish) yields. You can double, halve, triple or do whatever with one portion- depending on your needs. Some foods- eggs, for instance- contain a mix of fat and protein and they’re in a separate category. Fat Choices make it easier to keep an eye on how much to add to dressings. Sometimes you also need to top up your meals when they mainly include protein and some carbs. The section on Beverages gives clarity on non-alchoholic and alcoholic choices. This is not to actively encourage anyone to drink excessively on a low carb or ketogenic diet (on the contrary!) but to show you that there are options when you go out and socialize. Herbs and Spices should play an important part in everybody’s diet but are still often neglected and underestimated. Learn how to use them!